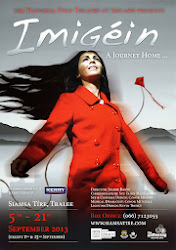 Clóda Curran is proud to be joining the cast of Imigéin in this new and exciting production. Clóda is 18 years old and a native of Tralee and has been performing with Siamsa Tíre since the age of seven. She has participated in many Siamsa productions such as San Am Fadó and Tearmann, and performing in their current productions Clann Lir and Oileán this Summer season. Clóda has performed with Siamsa Tíre in the Cork Opera house and the Civic Theatre in Dublin. Clóda is an acclaimed and accomplished Classical Singer and Pianist. Kerry School of Music awarded her Student of the Year for singing in 2011, and for piano in 2005. She was awarded silver and gold medals for voice and piano with The Royal Irish Academy. Clóda also received the prestigious Rotary Musician of the Year award for singing in 2012, and won the senior piano competition that same year. Clóda has played lead roles in many of the Kerry School of Music’s musical productions such as Les Misérables, Annie, The Wizard of Oz and Footloose. Another highlight for Clóda was a drama production of Massabielle, the story of St. Bernadette, in 2010, in which she played the role of Bernadette under the direction of Fr. Pat Ahern, the founder of Siamsa Tíre. Clóda has just completed her Leaving Certificate and will commence her studies in Radiography at the University of Bristol in September 2013. She plans to combine her studies with her love and passion for the musical arts. What are your memories of your first performance on stage at Siamsa? I remember 'San Am Fado' - doing the Chicken Dance! If you were stranded on a deserted Island and you could only have one thing, what would it be? Give details of a funny or embarrassing (at the time) incident you were involved in at Siamsa Tire. When I was in 'Tearmann' I was pulling the doll's head off (part of the show-really it was!) and it didn't come off, awkwardly I had to pull the Velcro apart - it was VERY LOUD! Never outside Siamsa did I (Irish) dance or sing traditionally, and the best thing is training & learning & making the best of friends here!